Traditionally, customer support centers were regarded as mere cost center. However, they are becoming to have more and more crucial role in turning dissatisfied customers into loyal ones. I work in customer loyalty industry, and I am always curious how well companies treat their customer especially when they are not happy. So, whenever I myself experience subpar experience, I spend a little time at least to contact the service provider whether or not my dissatisfaction is big. The fee was $49 per course and the capstone project. So it is $49 x 9 courses + $49 x 1 capstone project = $490. You can either pay as you go or pay for the whole thing at once. 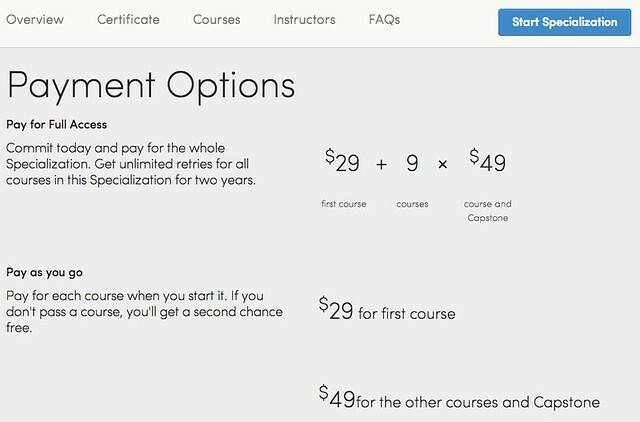 While coursera does not offer a discount by paying all at once, they let students to retake the course as many times as they want if paid in full upfront. Just few days after I enrolled, coursera announce that the reduction of the price: Now the first course costs only $29. In other shopping experiences in United States, the customers usually get price adjustment if they go to complain. So, I was curious how coursera would handle this case. I first asked for the partial refund. Their response is that it is not possible because their "payment system doesn't allow for partial refunds or price adjustments". 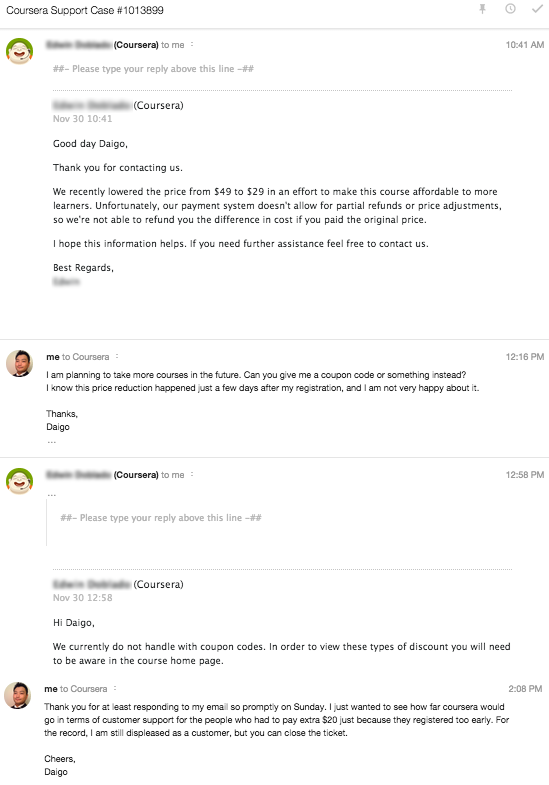 I am not that sympathetic their poor payment system, so I asked if they can issue a discount coupon so I can apply to a course I will take in the future. The answer was again no, saying that "in order to view these types of discount you will need to be aware in the course home page." All these while, the customer support did not say anything like, "I understand your frustration." or "Let me see what I can do for it." to show that they recognize this as an issue, and they would at least try to resolve it. At this point, I decided that it is not worth my time to talk to him any more for $20, and I asked to close the ticket. "They made it easy when there was a problem. And the true measure of a company is how they handle it when things go wrong," Leland said. "They made a loyal customer out of me. A shoe is just a shoe, but they're adding value to the shoe through the service." Yes, it is worth quoting again: "they're adding value to the shoe through the service." To me, it wasn't really about $20 partial refund. Of course, it would have been better if they could actually give me the price adjustment. But I wanted really from coursera was respect. I wouldn't have felt this bad if coursera showed the understandings to my frustration as a customer, and at least they tried to do something about it. It does not matter whether or not they could refund. What I got was a very quick response saying no without putting any thoughts for my pain. As I wrote before , I love coursera as a whole, and I will continue using their service. But I would really like them grow also by reviewing how they treat their customers. It was worse than the bureaucratic offices in the real colleges.